“Every parent longs for the perfect college education for his or her child. You want them to attend an institution with high standards, knowledgeable faculty, and an environment where your child can get proactive and make a difference. From our first visit, we were convinced that New Shores was this place for our son Akshay. During that initial contact, the young lad who served as our counselor described the differentiating things of New Shores from other conventional colleges as the faculty and Global curriculum. Among the other thing he mentioned, the small class sizes stood out for us. We were sold and have never regretted that choice for a moment. 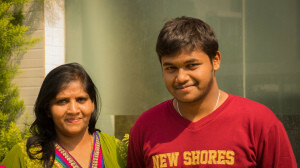 At New Shores, Akshay received a solid professional and liberal education from NewShores’ Global curriculum. He benefited from being able to build close relationships with the faculty members; their office doors were always open to him, and on numerous occasions, even the doors to their homes were opened for meals and enlightening conversations. Some of Akshay’s fondest memories of his college days are the hours he spent in his favorite professor’s offices discussing politics, music, business, and life in general. The formal education was second to none. New Shores’ small environment is nurturing to its students, allowing them to get involved in many aspects of college life. Extracurricular activities abound! The campus boasts a wonderful music bands, special-interest organizations, sports teams, the student journal, theater – the list goes on and on. Opportunities for growth and leadership are numerous. For two years, Akshay enjoyed the pleasure of serving as the captain of College’s Basketball team that enabled him to build strong leadership skills and close relationships with the senior administrators of the college. The connections he made during his time at New Shores will be a source of support and contact for years to come. Not only were the classroom lessons invaluable, the lessons in the community were an essential ingredient in the New Shores experience. Student’s Name: Akshay Kumar V, Global BCA Class of 2015. Mother’s Name: Nisha Harish Kumar. Occupation: Architect. Father’s Name: Harish Kumar V. Occupation: Engineer. 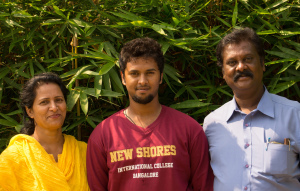 “My son Darshan completed his schooling in Sri Arobindo, and PU in Christ Junior College. We wanted to send him abroad for his bachelor studies but changed our mind. While looking for colleges in Bangalore, we had an objective of finding an international level, professional, very supportive yet disciplined college to my son. I came to know about New Shores International College through a family friend -Dr. T V Raju who is the Director of R.V Institute of Management. We all visited New Shores along with my son and applied for the course and he got selected in the second list. Darshan has now completed his second semester at New Shores and it has proven to be one of educational and personal enrichment. His perspective of the world and life itself has broadened. He has been inspired and challenged by outstanding professors to do his best and strive for excellence. Darshan feels he is changing at a fast pace because of his discoveries on many thing around him. He has come to admire and respect his professors as well as New Shores staff for the many opportunities afforded him. Mother’s Name: Geetha Ikkeri. Occupation: Art Curator. Father’s Name: V. P. Ikkeri. Occupation: District Magistrate, I.A.S. Swine Flu(H1N1 Influenza) Vaccination Drive at New Shores IC Ethnic day- A day of diversity celebration.